The village of Steveston offers a myriad beautiful places, restaurants, shops, etc. I absolutely adore it. It would be even much more fun to explore Steveston if my good friend Erica Hargreave were in Vancouver (which she isn’t because she is dealing with family stuff at the moment). 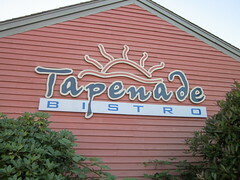 But since my Mom is here I wanted to show her Steveston and I took her for dinner to Tapenade Bistro. 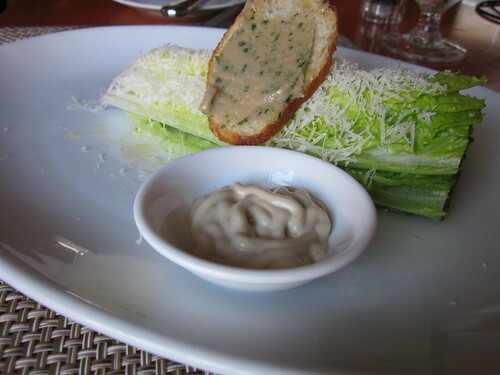 To start we ordered a Romaine Heart Salad ($9.5, Parmigiano-Reggiano, garlic confit and anchovy crouton, “Caesar dressing”), which is a sophisticated version of the more pedestrian romaine heart salad (or the pedestrian version of a Caesar salad). I love how Chef Tung goes all out and inventive on his dishes. 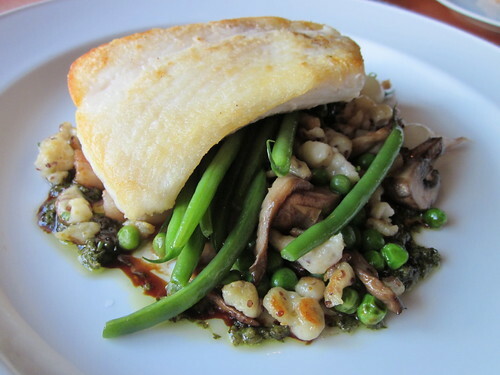 For dinner, my Mom ordered the Haida Gwaii Halibut ($29, pan seared, grainy mustard spaetzle, ragout of double smoked bacon, mushroom, peas and pearl onions, herb garden salsa verde, pinot noir jus), which she indicated was absolutely delicious. I tried a bit of it, and found that while the ragout of double smoked bacon, mushroom, peas and pearl onions could potentially have overpowered the halibut, the combination was savoury and left me with a smooth taste of fishy bacon. Or bacony fish. Any of the two is great. 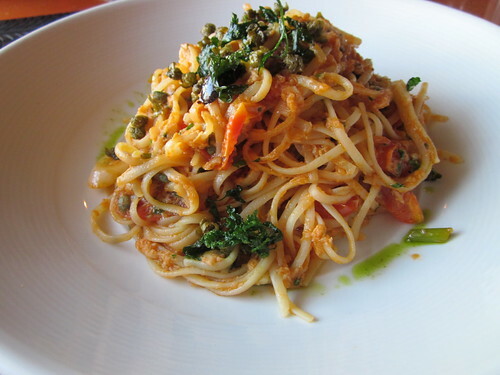 For dinner, I ordered what now ranks in my books as THE BEST EVER Linguine “Puntanesca” ($20, Line caught albacore tuna confit, kalamata olives, capers, scallion, Chef’s spicy tomato sauce). I have never, ever, ever had a better version of the Puttanesca (note that Chef Alex Tung calls it Puntanesca, most likely a play on words with the fact that the sauce includes albacore tuna confit (more delicate and a bit less powerful on the palate than the anchovy, traditional in any reputable Puttanesca). Chef Tung also includes scallion for good measure and doesn’t go out of the way on the spicy tomato sauce, which is great because the end result is smooth, silky and you can’t stop eating it once you start. In January 2003, Vince Morlet opened Tapenade Bistro with the idea of bringing an urban bistro to the historic fishing village of Steveston, BC. Over the past several years, Tapenade has earned the reputation of being an exceptional neighbourhood bistro with great food, outstanding service and fantastic wine. The menu is steeped in French tradition, though is updated with west coast sensibility and is presented in an approachable and informal setting. The philosophy behind the Tapenade kitchen is to showcase the natural beauty of local, sustainable and seasonal ingredients in an appropriate and sumptuous manner. Tapenade’s wine list is comprised of carefully selected wines with a focus on BC, California and France. These thoughtful and inspired wines make an ideal accompaniment to Chef Alex Tung’s simple, yet elegant cuisine. The restaurant seats 75 inside, as well as 70 on the patio for those warm days in Steveston Village. Tapenade is a stand alone building which makes it a perfect restaurant for large functions such as wedding receptions, private parties and corporate events. With a dedicated and passionate staff, critically-acclaimed food and a comfortable neighbourhood setting, the team at Tapenade Bistro looks forward to welcoming you. While Tapenade Bistro is not an inexpensive restaurant, I didn’t find the prices discordant with the quality of service (which was excellent) nor with the quality of food. The portions are generous, the food is exquisite and I feel that I paid exactly what it was worth. And we had to walk for a solid hour afterwards to process everything we ate, we were THAT full and we loved the food THAT much. I’d definitely recommend Tapenade Bistro as a great spot for dinner when you want to impress the person you are going with, and I definitely think my Mom was impressed. Disclosure: I paid entirely for both of our dinners on my own dime. I wasn’t paid to write this review, nor was I required to do so either. The purpose of this blog entry is just to describe and document my experience at a restaurant I really liked. In any review I write or publish on my site, I retain editorial control at all times. Should you have any questions/concern feel free to contact me via e-mail through my contact form. Raul, no one has ever gotten my “Puntanesca” wording before. Such attention to the details! Years ago, I was in Punta Cana on vacation and I had the most amazing spicy fish stew, which reminded me of the flavours of traditional spaghetti puttanesca. Ever since then, it’s been my own inside joke.